Home / News / TAT MATHS EXAM PAPER SOLUTION BY ACCURATE ACADEMY. 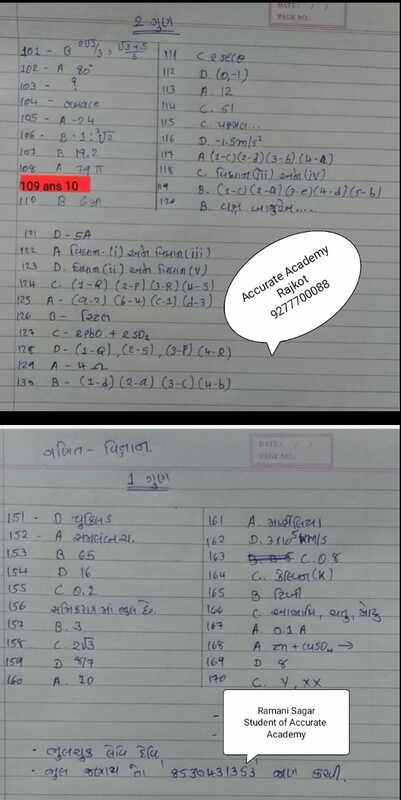 TAT MATHS EXAM PAPER SOLUTION BY ACCURATE ACADEMY. The State Education Board (SEB) of Gujarat, will declare the Gujarat TAT Answer Key 2018. Candidates can access the Gujarat TAT Answer Key 2018 through online mode only. Answer key is a very helpful resource for the aspirants of Gujarat TAT 2018. Through Answer Key, aspirants can predict the probable scores that they have achieved. Answer Key will help students to check their performance and possibility of predicting if they have cleared the exam or not. For every correct answer, candidate will be awarded with 1 mark only. There is no negative marking for this exam. With the help of this article, candidates can check the complete details regarding Gujarat TAT Answer Key 2018 and how to download the same. When State Board of Gujarat publish the Answer Key of Gujarat TAT 2018 on the official website, aspirants will be able to check the same. Here, the link and schedule is given below regarding the release date of Gujarat TAT Answer Key 2018. Click Hete To Download Maths Paper Solution.